Nymph Monte made light work of his opposition in the Egmont Cup (2100m) at Hawera last-start and his trainer and part-owner, Grant Nicholson, is hoping he can continue that form into the Listed Ricoh Feilding Gold Cup (2100m) at Awapuni on Saturday. 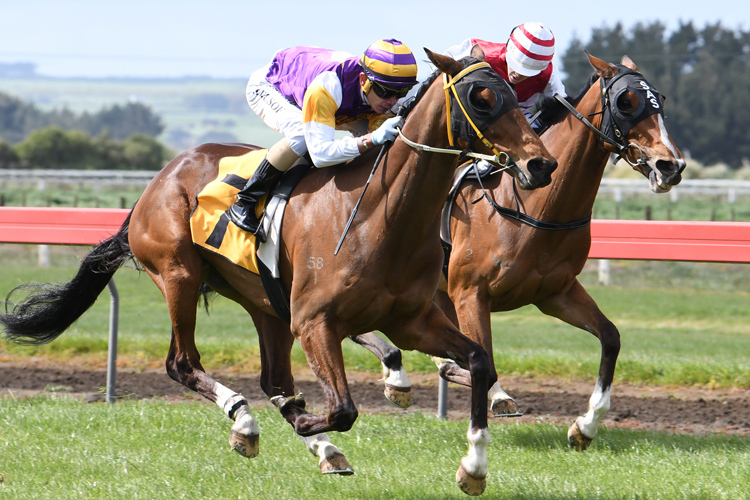 The seven-year-old gelding had put in two pleasing runs at Hastings over the spring carnival before his run in the Taranaki feature earlier this month, where he recorded a one and a quarter length victory over Group One-winner Ladies First. “He was building to that run after Hastings and just needed a bit of luck on his side. It was a very good effort and a good ride as well by Shafiq Rusof,” Nicholson said. The dual stakes winner will jump from barrier seven under apprentice jockey Wiremu Pinn and Nicholson is hoping for another strong run. “We’ll try and put him in the race again and see if we can get a bit of luck around the top and get out in the open and hopefully he can finish it off again,” he said. Nicholson has been pleased with how Nymph Monte has been performing this spring and is now eyeing a Cups tilt with his gelding later this month. “He’s been in great form all year,” he said. “At Hastings he just didn’t get the breaks at the right time, but I have been very happy with him, from his trial right through. He has been going good so far, so fingers-crossed we can keep it going.